I woke up at 7:30, already deciding that, while I would go to the first panel this morning, I would find someplace to take a nap for the second one. At least I’ll be able to get some sleep tonight, as I won’t be going to any panels tomorrow, and the first film is at 11 am. During breakfast at the hotel, I saw highlights of the royal wedding (I heard later that some people stayed up and watched the wedding live). V joined me and told me that she got a room for Friday. Unfortunately, the maid was in the room when I headed back, so I had to wait until she was finished before I could brush my teeth. As a result, I almost missed the shuttle. In the shuttle, I ended up talking to a couple (looked like they were in college) who mentioned how great it was that Ebert alone picks the films for the festival, rather than having some committee do it. 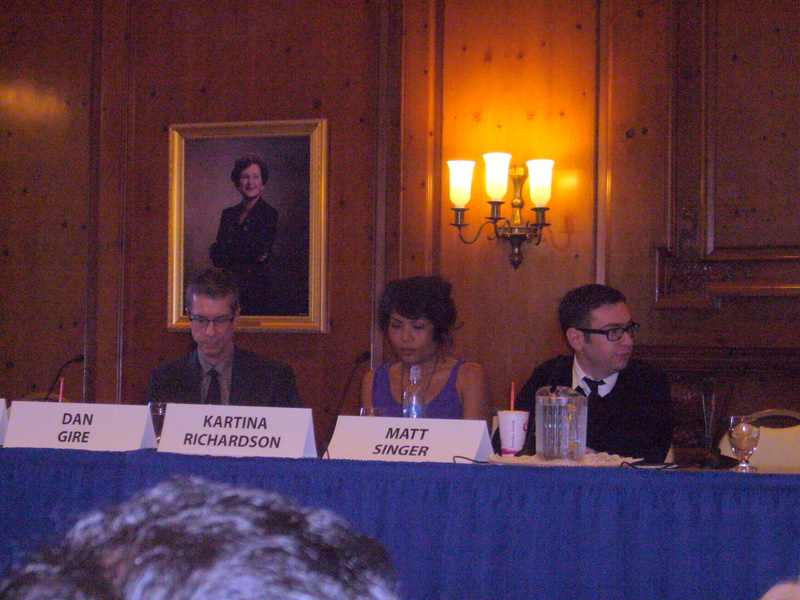 The first panel was called Ebert Presents: Reinventing the TV Show in the Digital Age. Before it began, I saw some very tired Ebert Presents hosts outside. Then again, they had both gone to karaoke. And Christy stayed up to watch the wedding. In fact, most of the people looked a little ragged — except Ali. He had on running shorts and seemed full of energy. I remember hearing about his legendary energy at last year’s Ebertfest. It seems that it’s true. I went to get my seat with V. Kenji also joined us. Before the panel began, I saw Grace Wang standing with Tom Dark. She looked just as I expected her to, except more awake than I thought someone who had recently come back from China would look. I pointed her out to the other two, but they hadn’t met her yet. Tom saw me and waved. I waved back. Of the two panels I saw, this one was the livelier of the two. 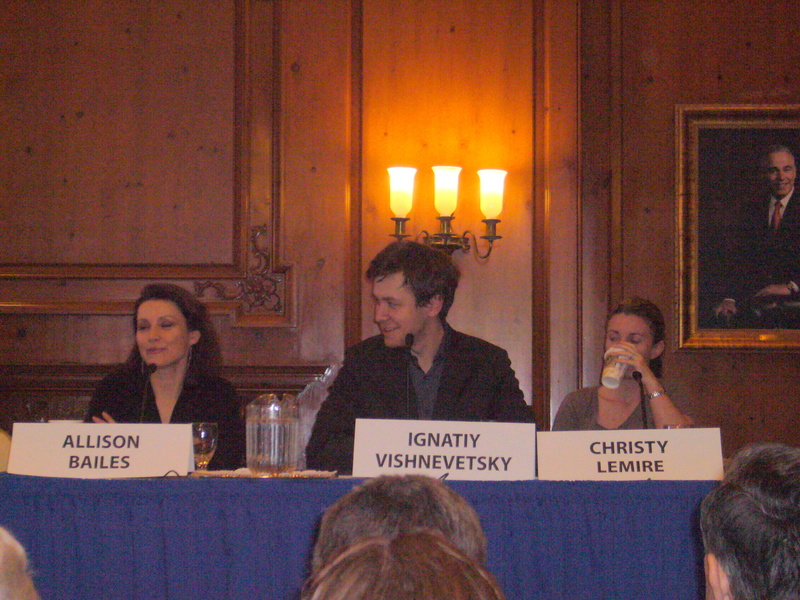 The panel included (l-r): David Poland, Matt Zoller Seitz (who came a little late), Dann Gire (spelled wrong on his namecard), Kartina Richardson, Matt Singer, Allison Bailes, Ignatiy Vishnevetsky, and Christy Lemire. Dann Gire, in particular, made some excellent points on why criticism still matters and how big movie companies control the market. Concerning the former topic, Christy pointed out, “We’re not curing cancer,” but some other people on the panel thought that criticism may, in fact, be just as important (unfortunately, it appears as though the sound on this panel wasn’t working properly). Another topic concerned reading criticism of oneself online, something that Ignatiy and Kartina admitted doing. The most lively discussion, however, had to do with how films are distributed. Independent filmmakers are trying to expand their market by using new media (such as the Internet), while big companies are trying to take over more markets so that they can charge more per service. Chaz moderated, and started off by saying that they were still friends with Elvis Mitchell, Michael Phillips, and A.O. Scott, since rumors have swirled about why they aren’t included in the new show. She kept the panel going, and also kept the questions from the audience moving. During the middle of the discussion, Roger moved to the center aisle and took photos of the panel. At one point, he was standing next to my row, only one chair away from me. When the panel was over, I saw Grace waiting to say hi to Roger. She had a huge smile on her face. I knew it would be a touching moment, but I couldn’t get my camera out fast enough. So instead, I merely watched as he noticed her, she opened her arms, he opened his arms, they met in the middle, and gave each other a big hug. She also saw Chaz and gave her a hug, too. At this point, I headed over in her direction, eager to introduce myself. Around this time, the guests for the next panel were filing into the room. I saw Grace heading past me as I walked up to the front. Now normally, I don’t call out people’s names in public places, as I don’t like drawing attention to myself. But there was no way in hell I was letting her walk past me, unnoticed. Then Kenji came over and introduced himself. She said she had kind of recognized us from our photos online. That is also when Kenji mentioned that Michael was meeting him and a few other people for lunch, if we wanted to go. Grace didn’t have Michael’s number, so she gave her number to Kenji so that he could text her when Michael arrived. I then took off, saying I was going to find a comfortable chair in the lobby to sleep in until then. My nap was fitful, even though the chair was comfortable. I also woke up at one point (I hadn’t really been asleep) because I heard Grace’s voice nearby. She was with a guy I had seen around before (he came to karaoke), but hadn’t met. She introduced us, saying that I was one of her blog readers “since the beginning.” This touched me, as she said it with real gratitude, as if the success of her blog were all due to me. The guy was Kevin Lee, here for Fandor.com. They went to talk and wait outside, while I went back to my nap. Unfortunately, I got up and took an ill-timed bathroom break later. When I returned to the lounge, I saw that Michael was outside, having collected a bunch of people to go to lunch. Unfortunately, there was no more room in their car, so I made sure to get the name of the restaurant they were going to (Black Dog, which you can read about here) and said I would catch up with them later. Unbeknownst to me, my usual ride had decided to take the day off. While waiting to see if anyone was going there for lunch, I ran into Russell again (Olivia’s husband) — though I had to stand upwind from him so as not to have smoke blown in my face. When the panel ended, I found and then lost V, who told me that our usual ride wasn’t coming. We ended up walking from campus to the Aroma Cafe. Having not gotten much sleep, I was very chatty. If I had walked with me, one of the me’s wouldn’t have survived. I also looked for a surcharge free ATM on the way, since I was low on cash, but couldn’t find one. 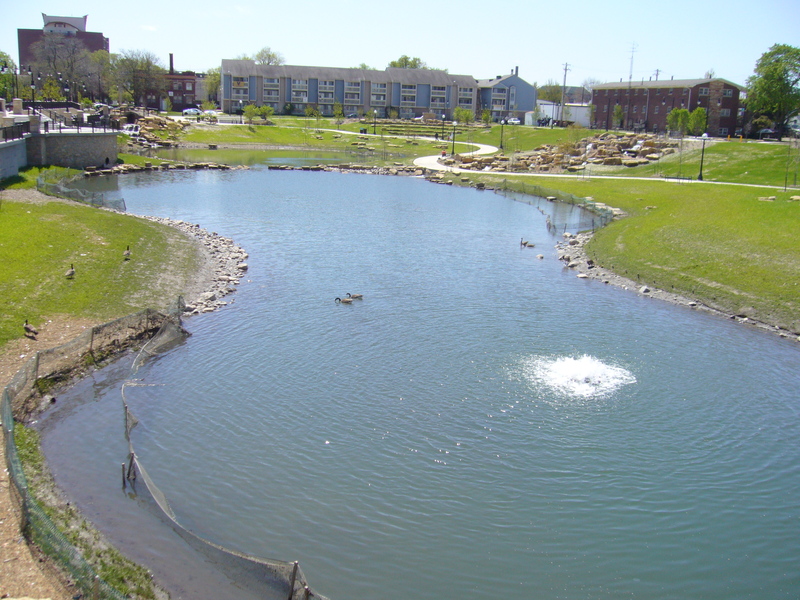 ...but I did find this beautiful pond. “You’ll still have to throw it out,” she said. This, despite the fact that the guy who’s in charge of all the volunteers told me and the others, the first day, that empty water bottles could be brought into the theater. Grumbling, I threw out the bottle, but complained to my seatmates about bottle Nazis once I was inside. Luckily, the movie was worth braving the bottle brigade. 45365 is a documentary about Sydney, OH. 45365 is its zip code. Each portion of the film is introduced by one of the numbers in the zip code, starting with the “4”. The movie is largely plotless, giving us the experience of living in this town, versus trying to force a narrative upon the people and events we come across (one of my favorite segments: a guy who calls the police because his cable isn’t working. I also enjoyed the pig race). This is the right decision. Though the same locations and people pop up again and again in this film, what we get are pieces that, when put together, form a whole, just as a quilt is formed when its different components are stitched together (and I believe the brothers who directed this film, Bill and Turner Ross, used this allusion when describing their film afterwards). Certainly, we get more of a sense of what this town is like than we would have had the film followed a more conventional storytelling approach. An excellent film that unfortunately cannot be released outside of festivals due to copyright issues involving songs used in the movie. Let’s hope that this movie is rescued, as Killer of Sheep was, so that a wider audience can see it. (Interesting note: Bill and Turner decided to make a documentary because they were influenced by Roger and Gene’s championing of Hoop Dreams. Something tells me that Gene would have championed this film, as well). 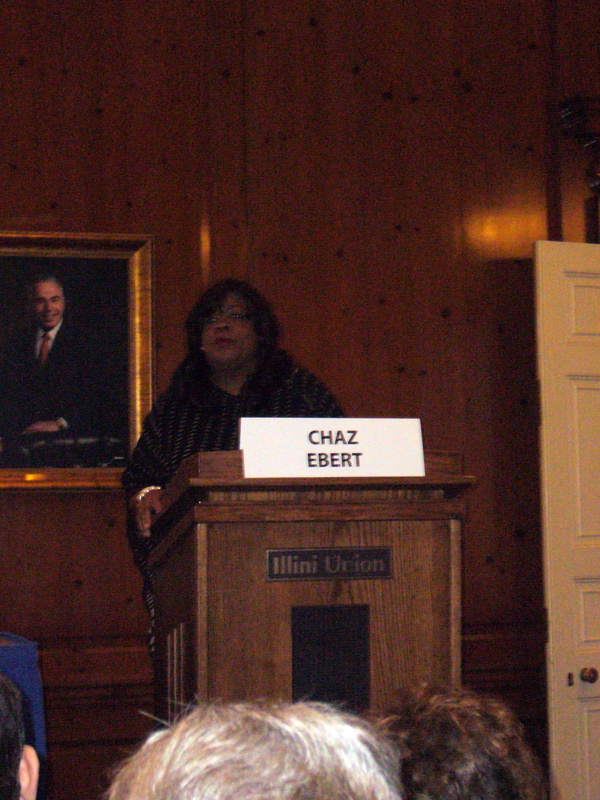 The directors give Chaz and Roger a local newspaper, with the front page detailing their showing at Ebertfest. On the panel for this film were Janet Pearson, Matt Singer, and the two directors. Bill was the principal editor, and he had to cut 500 hours of film down to 90 minutes. Eventually what made it into the film were their favorite moments. And while they (wisely) decided not to show the result of the football game in the movie, the local team got crushed. While filming, they also spent lots of time with these people with the camera off. Maybe that’s why, on the day they stopped filming, a “300 pound sheepherder” cried. Luckily for us, they are currently working on two more projects, one set in New Orleans, the other a Western. The next film was Me and Orson Welles, which I saw previously, but was even better the second time around. 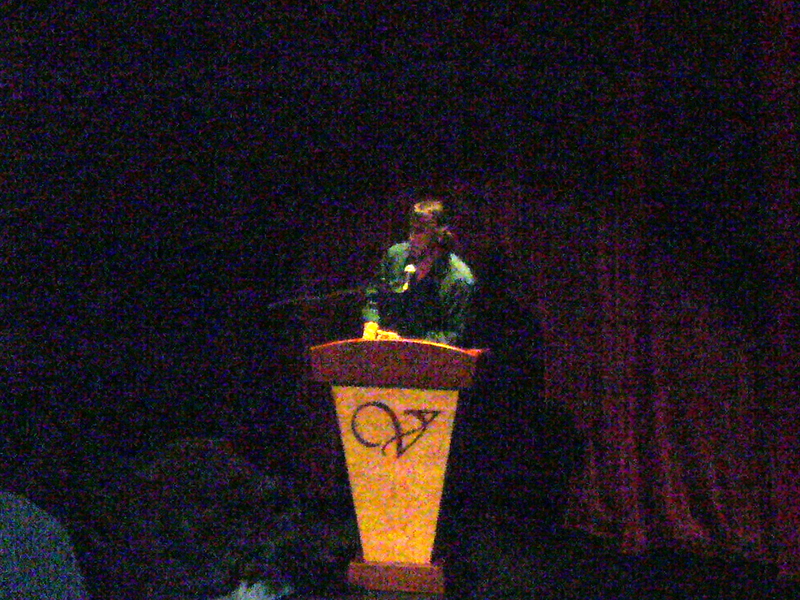 Richard Linklater introduced the film. 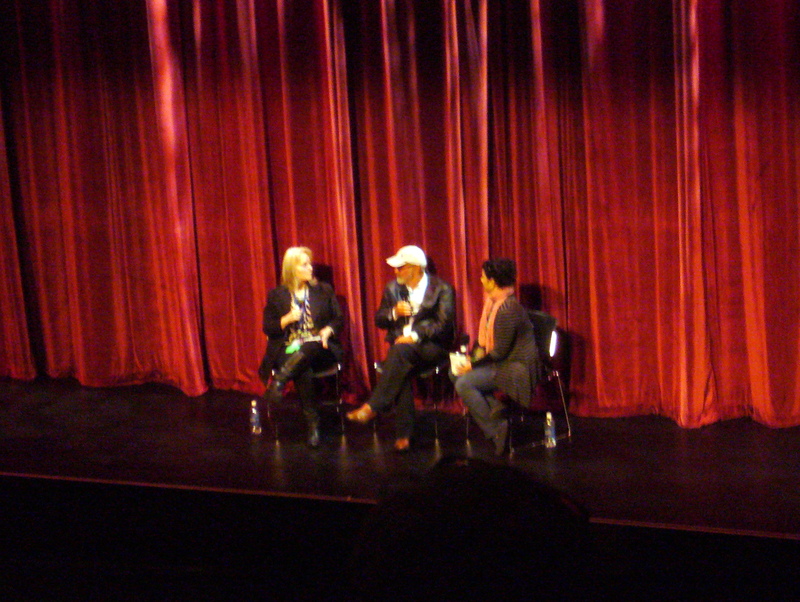 Once the film was over, he was joined onstage by Ali and Ignatiy. Me And Orson Welles is a big-budget Hollywood film that is in love with the theater. What makes it work beyond that, however, is the towering performance of Christian McKay as a young Orson Welles. Zac Ephron also does a good job as Richard Samuels, a high schooler who gets a part in Welles’s production of Caesar. With a supporting cast made up of seasoned theater actors, and the lovely Claire Danes as Sonja Jones (Richard’s love interest), this film ends with one of the characters saying, “It’s all ahead of us.” And this time I realized, that line is true for Welles, too. (Note: This line is said by a character who only appears in the beginning, middle, and end of the film. Her name is Gretta, and she is played by Zoe Kazan, whose name you should remember). 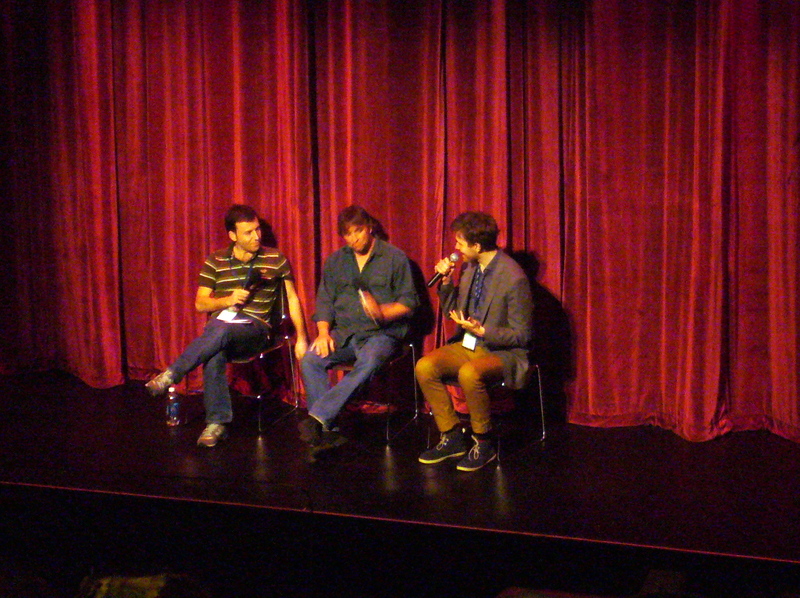 I was planning on asking Linklater a question during the Q&A that followed (after all, he has made two of my all-time favorite films: Before Sunrise and Before Sunset), but the question I had about what experiences he had in theater that infused his knowledge of the source material was answered pretty well during Ali and Ignatiy’s talk with him. In brief, he did some theater in high school, and most of the cast had vast theater experience. Christian McKay was discovered while performing a one-man show in London called Rosebud: The Lives of Orson Welles. McKay also was a former child prodigy, a “19 year old concert pianist playing Rachmaninov,” as Linklater put it. Only a few photos of the original Mercury Theatre survive, and photos are all we have of Welles’s production of Caesar, plus memoirs from the cast. Linklater also talked to the few survivors who worked in the Mercury. Linklater shot the film over the course of 36 days, half of that time filmed in an actual theater in England, using mainly British actors with lots of stage experience. Ephron’s character is based on a real person in the play. Arthur Anderson was twelve years old when he played the role in Caesar that Ephron plays in the film, though he’s more famous for doing the voice in Lucky Charms ads. And, he’s still alive. Welles had no money when he produced Caesar, which is why such bare staging was used. His use of lighting, however, impressed Gregg Toland, and gave Welles his cinematographer for Citizen Kane. Also during the Q&A with the audience, Linklater occasionally asked trivia, giving the lucky winner either a poster or a soundtrack from the film. I did not win either. After using the restroom, I ran into Randy, who introduced me to another contributor on Ebert’s Journal, Sean Kelley. 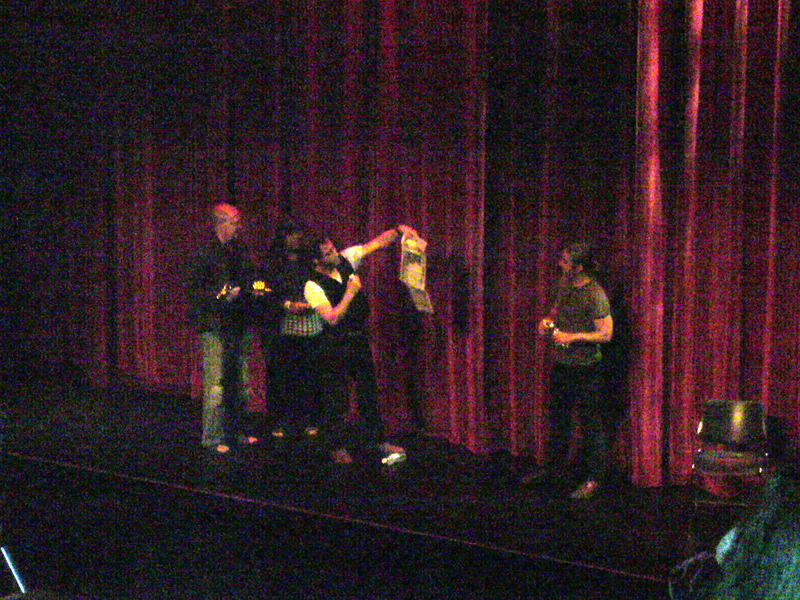 Sean had run to the edge of the stage once Linklater was done and had gotten him to sign his copy of the complete scripts for Before Sunrise and Before Sunset. Upon meeting me, Sean said that he expected me to be older, but I wonder if he confused my youthful looks with my actual age. 😉 Also, I heard that Robbie Pickering (Natural Selection) had rushed to the front of the theater to get photos of Linklater. Always nice to see directors who are themselves fans of directors. For dinner, a bunch of us headed to Jupiter’s, which has really good pizza. This time, Anne paid for all of us. The final movie of the night was Only You. Strangely enough, the version of the song I was thinking of was not the version used in the film. It stars a young Marisa Tomei as a woman named Faith who believes that she is destined to marry a man named Damon Bradley, due to an encounter with an Ouija board and a fortune teller at age eleven. The film begins there, then skips ahead to when Faith is an adult, deciding whether or not to become engaged to a podiatrist named Dwayne (John Benjamin Hickey). After all, his name isn’t Damon Bradley. She eventually decides to accept. But then, before their wedding, she receives a telephone call from a friend of Damon’s who says he can’t make it to the wedding. His name? Damon Bradley. So, Faith takes off for Italy to track him down, along with her best friend, Kate (Bonnie Hunt), who is going through a rough patch with her husband, Larry (Fischer Stevens), Faith’s brother. That is where Faith meets Peter (Robert Downey, Jr.), who pretends to be Damon Bradley because, at first sight, he has fallen in love with her. It also leaves to a hilarious scene, later in the film, with Billy Zane as the “real” Damon Bradley. Now, as sweet and cute as Marisa Tomei is in this film (she was coming off her Oscar win in My Cousin Vinny), her single-mindedness in trying to find Damon Bradley began to grate on me after awhile. Bonnie Hunt, on the other hand, gets some great lines, and other fun scenes rely on the timing of the Italian cast. Plus, I am secure enough in my masculinity to say that Robert Downey, Jr. is quite cute in this film, as well. In fact, “cute” best describes Only You, which is able to use plot points at airports that now, in our days of freaking out at shadows, could not be used. Bonnie Hunt was the first actress hired for the film, and she really wanted the part. The reason the moon is shown so much in this film is that all animals relate to the phases of the moon. He made the film because he wanted to shoot a film in Italy. He first met Ebert on the set of Gaily, Gaily. One of the most interesting stories of the night concerned his brush with racism in the South. 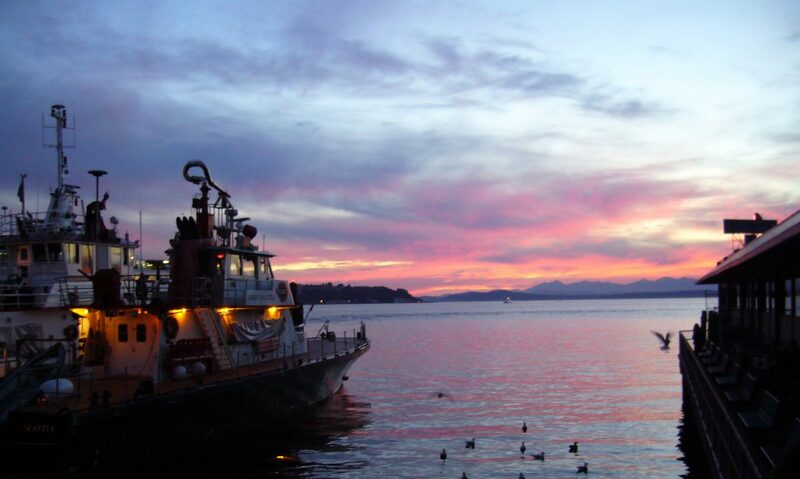 As a member of the Canadian Navy, he had gotten on a bus, in his uniform, in the South. When he went to the back of the bus to sit down, the bus driver said, “You tryin’ to be funny, sailor boy?” That’s when he realized that the bus was segregated; only black people sat in the back. Not knowing what to do, he got off at the next stop. After the Q&A was over, I met up with some of the FFCs in the lobby, where they were getting ready to head out to a party. Olivia asked if I was going. I hadn’t heard there was going to be a party, at which point she thought it might be invite only (especially since she had an invitation). She said to go ask Michael, but when I saw him, he asked the same question Olivia had asked. I told him it might be just for the FFCs and VIP guests. Outside, I saw Grace, Susan (Grace’s driver), Tom, Donny, and Anne talking about meeting for coffee tomorrow. I hitched a ride back to the hotel with Donny and his wife. Tomorrow I would get to sleep in a bit, after having gotten back to the hotel at a decent hour – for once.